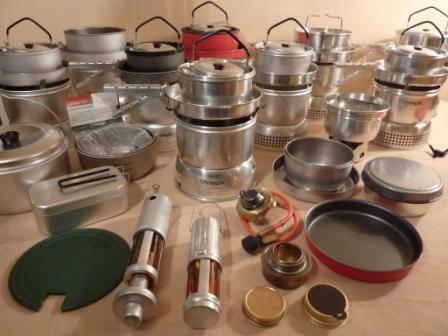 This is a website covering "all things Trangia" from vintage and discontinued products to the present day range of camp stoves and accessories. If you're a collector looking for information on vintage and discontinued items, or you're looking for the latest information on the current range, or even just searching for some useful tips or camping recipes, you will find it all here . The company, based in Sweden, was founded in the mid 1920s by John E Jonsson. primarily producing household cookware and various camping sets, then in 1951 the first model 25 stove set (or storm cooker as its know in Sweden) was produced, designed for 3-4 people. At last, a completely self contained, lightweight and portable camping stove that contained its own solid brass spirit burner. From that moment on there was no looking back, the model 25 was a great success and has been used and loved by thousands of outdoor enthusiasts worldwide . Later came the smaller 27 series designed for 2 people, after that came the 28 also known as the mini, designed for the solo adventurer. Over the years the company produced many camp stoves and accessories in a whole host of different materials including aluminium, titanium, non-stick, and Duossal which is stainless steel + aluminium pressed together to form a stainless steel liner to the pans, the latest material is HA that stands for hard anodized aluminium, I will discuss these later in more detail on other sections of this website. Some materials and accessories have been discontinued and have become highly sort after by collectors and enthusiasts, these will also be discussed in more detail on this site. The company has over 80 years of history behind them, the camp stove has proven itself time and time again in some of the most harshest environments on earth . I have been using Trangia stoves and accessories for 20 years in all sorts of situations from family camping trips and backpacking adventures to even using the stove as an emergency cooker during a power cut. So if your into prepping and emergency preparedness keeping a Trangia stove and fuel bottle in your cupboard is a good idea... it might just come in handy next time your power goes down. My first camp stove was a 27-2 which is the cook set I still use today, in addition I have added the multi-disc, 2.5L billy pot and Duossal pans. During 20 years of regular use, I can honestly say its never let me down, broken or had any negative issues and is as reliable now as the day I bought it. The stoves reliability lies in its simplicity ... low maintenance , safe and stable design with a wide footprint and protective windshield, in addition the stove has no mechanical parts to go wrong. Strong, light and durable with nesting pans, everything fits together to form a lightweight compact unit that fits nicely into a rucksack, furthermore the camping stove and fuel bottle is recommended kit for the D of E and has also been used by the military and a whole host of outdoor adventurers including cyclists, hikers, canoeists, mountaineers, just to name a few. 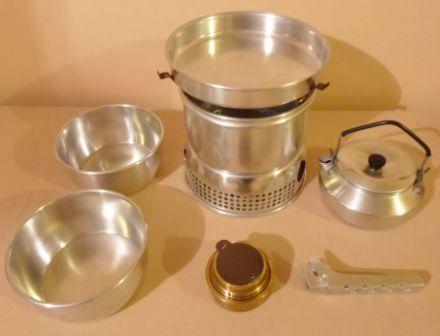 Over the years I have put together a modest collection of trangia stoves and accessories, some I have used, some are vintage and collectable, the photo at the top of the page shows part of the collection and a sneak preview of things to come, hopefully you will find them interesting and maybe leave a comment, or send in a photo or two of your stoves and accessories. Other manufacturers have tried to copy these products, producing very convincing lookalikes, my advice is invest in the real thing, the original and by far the best camping stove of its type. Below is a photo of my original model 27-2. This website is still under construction, please be patient, as new pages are added every week.